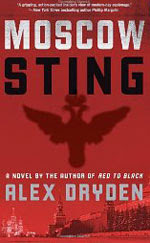 In his new release, Moscow Sting (Ecco) -- the sequel to 2009’s Red to Black -- Alex Dryden picks up the story of Anna Resnikov, once the youngest female colonel in the KGB, who defected to the West out of love for Finn , a British MI6 operative who has since been murdered. As Finn’s despondent widow, she has been stashed in a “safe house” somewhere in the south of France with their 2-year-old child, Little Finn. Only recently has she begun to feel an interest in life again and look forward to the periodic visits by her handler, Willy. Unfortunately, the Russians (KGB), the Americans (CIA), the Brits (MI6), plus other independent intelligence agencies all want Anna. The Russians want her dead for her betrayal with Finn, and the other agencies want the information and contacts she can supply. Finn was the only handler for a spy buried deep in the Russian hierarchy (code name: Mikhail), and Anna now holds the key to Mikhail and his secrets. • Adrian Carew, the head of MI6, is obsessed with avenging Finn’s death. He now has the identity of the killer and wants Anna to help him exact his retribution. • Logan, a clever freelance espionage agent, is constantly trolling for information. During a routine lunch with one of his blustery contacts, he stumbles on a clue to the possible whereabouts of Anna’s safe house. After confirming his hunch, Logan proceeds to sell Anna’s location to various intelligence communities in a large-scale double-dipping scam. • Lars, a hired assassin, specializes in extreme challenges. His prowess with difficult shots, which include maximum distances and tricky angles, is told in loving detail. • Burt Miller, the jovial head of a private information-gathering firm called the Cougar Intelligence Agency (initials CIA -- ha ha), has seemingly unlimited resources with which to pay for intel and maintain safe houses all over the place. Then of course there’s Anna, the ex-KGB officer, who is at the center of this story. She had quickly advanced in the KGB, but threw it all away for love. Her son is the only thing she has left of her beloved Finn. She just wants to protect the boy, at the same time as she shields the mysterious Mikhail. But Anna has become a pawn in a dangerous game played by the Great Powers. And after a plan to kidnap Little Finn and blackmail Anna into returning to Moscow falls apart, Anna and her son are “saved” by Miller and relocated -- to America. The stakes for all parties involved are now higher, while the chances that matters might be resolved without bloodshed have declined sharply. The potential in these pages for an engrossing tale was considerable, but the results are less than satisfying. I think I finally understand what is meant by a “plot-driven story,” and it’s not a pretty picture -- or rather, not a rewarding read. If you want a book with minimal character development and negligible reflection, or one in which actions and lifestyle choices result in little or no personal angst, then Moscow Sting is just your ticket. One of the most annoying faults here is Anna’s behavior in regard to her separation from Little Finn, after their secret move to the United States. Anna finally agrees to leave the child behind and go to Washington, D.C., with Miller and Logan, hoping to convince Mikhail to defect. Apparently, she “talks” with her son, but how exactly does she accomplish that? Via Skype? And why does she seem curiously long-suffering but not frantic about their separation? Every mother I know (myself included, although my last encounter with a child of mine at 2 years of age was more than three decades ago) would be hysterical at such a parting under dangerous circumstances. Perhaps she feels that the safe house Miller has found her among the peaks of northern New Mexico (in the Sangre de Cristo Mountains, maybe?) is the equivalent of the Fortress of Solitude, and Little Finn is safe there. Who knows? Author Dryden doesn’t make it clear at all. Then there’s the later and thoroughly unconvincing plot twist involving assassin Logan. If you haven’t read Moscow Sting, beware here of spoilers -- and jump to the next paragraph. For everyone who has stuck with me, let me ask: Is there anything less believable than that Logan should kill Finn’s slayer in order to win Anna Resnikov’s love? “I want you, Anna,” he declares. Argh!! And why would Finn’s killer, a professional assassin with a strong self-protective impulse, who is known to spend plenty of time studying situations in order to achieve maximum lethal results against impossible odds, allow Logan to get within deadly range of him within just three days? Granted, that hired gun is a Russian thug from the provinces, but even a first-bracket apprentice assassin wouldn’t let his guard down in such a short period of time, would he? As I read along, I kept noticing references to Prime Minister Vladimir Putin’s KGB-controlled Russia and assorted modern-day spy schemes. I confess, I found those rather far-fetched until the news broke about a Russian ring of “sleeper spies” who’d been embedded in middle-class American life for the past 10 years. They were recently deported in a Cold War-style trade for several U.S. agents of a higher caliber, who had been jailed in Russia. Included in that ring was a couple with a small child, who held seemingly innocuous jobs in my old hometown. I found it all rather amusing. Later, though, I read that Putin had met with those deported spies near Moscow and joined them in singing the equivalent of the KGB fight song. That news, coupled with a very long article on corporate spying and a multitude of private agencies engaged in the so-called war on terror, made for a more compelling spy story than the one told in Moscow Sting. Maybe I should get on the anti-Russian, conspiracy bandwagon too. According to the promotional materials sent out with advance copies of this novel, Alex Dryden “is a pseudonym for a journalist who has lived in and around the Soviet Union and Russia for decades, with many years experience in security matters.” Well, he may have the inside scoop on Russia and the current business of spying, but as an author he is no master of character development or creating the nuanced motivations of his principal players. I found the cast here to be thinly drawn and cartoonish. The story would have made a better graphic novel, or perhaps an action film -- one starring Angelina Jolie. She does seem perfect for the role of Anna. A New Yorker review of her latest movie, Salt, described her character, Evelyn Salt, as “impervious: her cool lies in how little she responds to what happens to her.” That sounds like Anna to me. Comparisons between Moscow Sting and the espionage-fiction works of renowned authors John le Carré and Len Deighton are totally unjustified. Listen, I want George Smiley and his lamplighters back just as badly as the next lover of spy novels. And I remember with affection Bernard Samson toiling in Mexico while full of regret about his marriage going down the drain. But it’s a cheap trick to invoke those writers and get our hopes up. Most books I’ve read lately with blurbs comparing them to stories by Saints John and Len are major disappointments. Gretchen Echols is a Seattle writer, artist and bookstore employee with a longstanding fondness for crime and mystery fiction, especially the works of Ross Macdonald, Reginald Hill and Tana French.